Today’s post is about a popular quote that is often misattributed to Leonardo da Vinci. Read on to discover who really wrote it and who is spreading this misinformation. Because this quote was originally written in Italian in the 16th century, it has been translated into English many times by many different translators resulting in many variations. I am listing five variations below, but this is not a comprehensive list. I cannot provide an image due to copyright restrictions; however, the book can be found on Amazon.com. The above statistics show that websites with the sole purpose of providing quotes are the largest group propagating today’s misquote. If we combine them (31%) with the websites that provide quotes as a major part of their functionality (4%), we find that 35 percent of the websites perpetuating this misinformation are major quote repositories. Once again, we see that quote websites are not reliable sources for quotes. The vast majority of them feature data that is not fact-checked. Consequently, they are a key contributor to the spread of misquotes throughout cyberspace and modern literature. Avoid them at all costs. The above statistics also indicate that social media websites play a major role in the proliferation of today’s misquote. The user interactions that occur on social media create an environment that is conducive to the rapid spread of misinformation. Much like a virus, when one person posts an infected quote, all of his/her followers get it, and all of their followers get it and so on and so forth. The next thing you know we have a pandemic on our hands. And when that happens, untruths become “facts” which ultimately make their way into our culture and academia. My 12/31/15 post “No, Clara Barton did not write that” is an example of this. 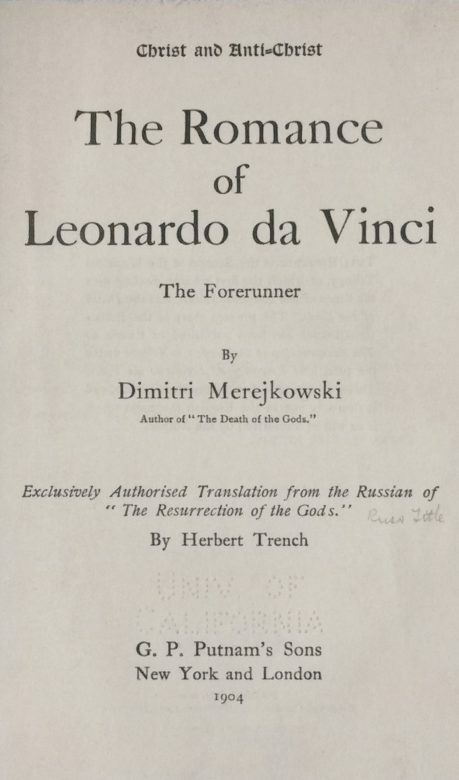 There is another variation of today’s quote found in the novel The Romance of Leonardo da Vinci (1902) by Dimitri Merejkowski. Below is the quote found in Book XII, chapter IV on page 328. Note the verb “see” is used, similar to the misquote. 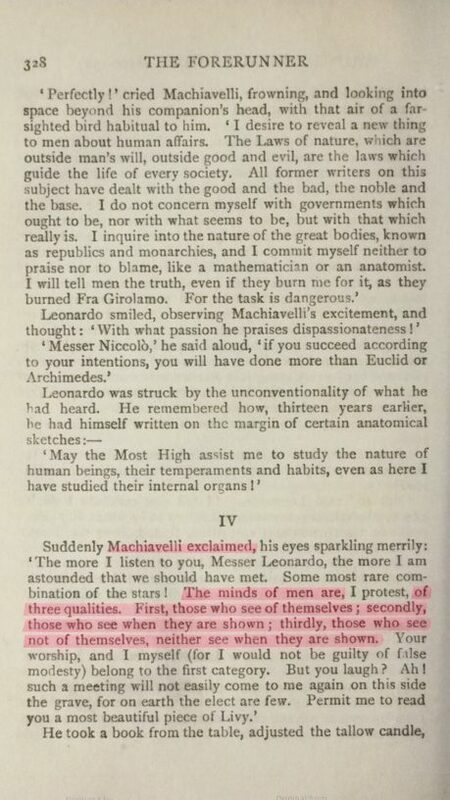 The pink highlight on the quoted page indicates that Merejkowski clearly wrote that it is Machiavelli who says the quote. The question is how did Machiavelli get replaced by da Vinci in the misquote? My guess is that somewhere in time some quote hunter found the quote in this book which has Leonardo da Vinci in the title and assumed he said it instead of Machiavelli and then posted it on the internet. Of course, this is pure speculation, and I could very well be wrong. But the use of the verb “see” only occurs in this book and the misquote, so I tend to think there is a correlation. Today’s misquote demonstrates perfectly why I do not like to use translated quotes. The wording can vary so widely across different translations that sometimes the entire meaning is changed. Fortunately, even though there are many wording variations for Machiavelli’s quote, the meaning does not change that much with each version. However, this is not always the case. My 06/07/14 post “No, that’s not how Benjamin Franklin wrote it” highlights a Latin quote that has a variety of English translations, each with a completely different meaning. I prefer to avoid this loss in translation by simply not using translations. Today’s misquote appears in at least 27 contemporary books. All were published in the 2000s, and three of them are quote books. One of the quote books is specifically Leonardo da Vinci quotes only. Unfortunately, it features today’s misquote AND the da Vinci misquote I wrote about in my 11/30/15 post “No, Leonardo da Vinci did not write that.” Like the vast majority of quote books on the market right now, this book does not include detailed source information with each quote. As I’ve written before, never trust a book (or website) that does not include information such as the name of the work in which the quote is found along with applicable data like chapter, act, scene, line, stanza, etc. If you cannot verify the quote with the data provided, it is not reliable. Sadly, I discovered today’s misquote on the University of St. Andrews, Scotland website. I’m always disappointed to see the quote virus infecting educational institutions. As usual, our misquote is available for purchase. That’s right! For just $24.65 you can have your own misquote mouse pad. (Wow, trying saying that three times really fast.) If you’re more of a fashionista, $29.95 will get you a beautiful misquote sweatshirt so you can proudly display something da Vinci never said, preferably to “those who do not see.” [Tee hee!] Yes . . . that is a feeble attempt at geeky quote humor. I haven’t come up with a vaccine for the quote virus yet, so for now our only weapon is education. You, dear reader, can help by sharing the knowledge. Forward this post to friends and family, and if you’re on Facebook, “like” my Facebook fan page. If you’re on Twitter, you can follow me @SueBrewton. Today’s post is about a motivational quote that is often misattributed to Andrew Carnegie. Follow along to learn who really wrote it as well as who is spreading this false information. 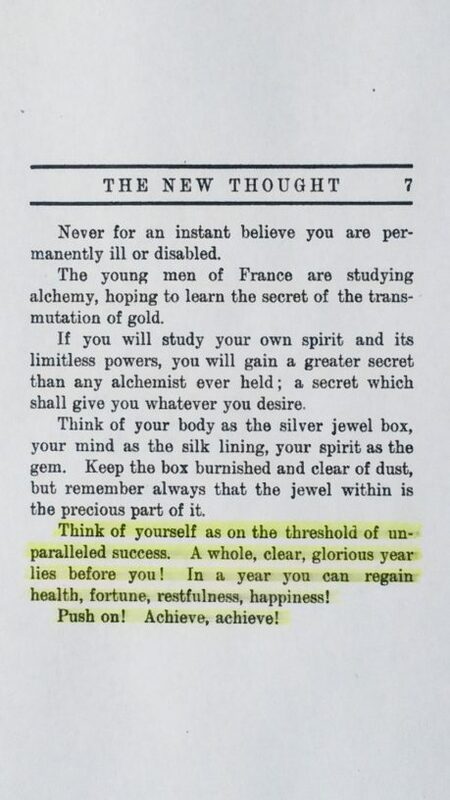 ✓Think of yourself as on the threshold of unparalleled success. A whole, clear, glorious year lies before you! In a year you can regain health, fortune, restfulness, happiness! 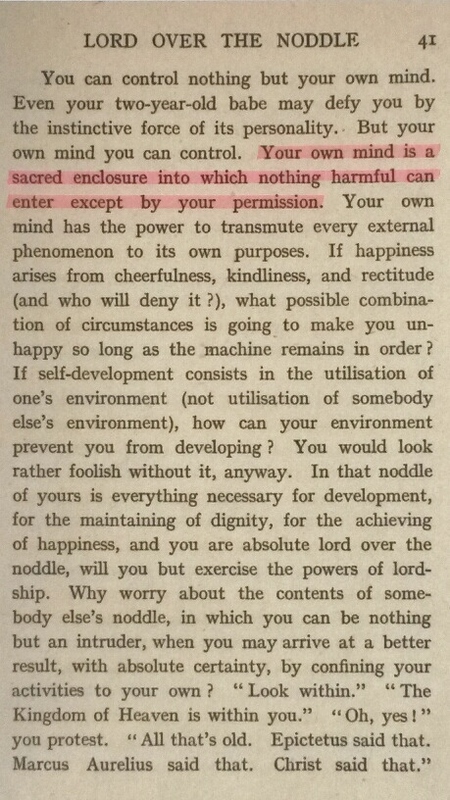 Here is the quote found in The Heart of the New Thought. 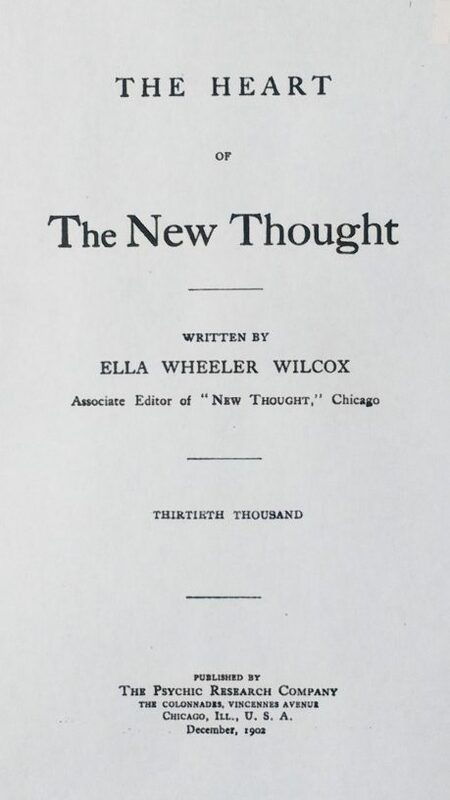 Here is the title page showing Ella Wheeler Wilcox is the author. Note: Andrew Carnegie authored several books, and this quote does not appear in any of them. After surveying 100 websites featuring today’s misquote, I found the following trends. The above statistics indicate that websites with the sole purpose of providing quotes are the largest group propagating today’s misquote. If we combine them (36%) with the websites that provide quotes as a major part of their functionality (16%), we find that 52 percent of the websites perpetuating this misinformation are major quote repositories. As I’ve written before, the vast majority of administrators for quote websites do not fact-check the data they are providing. And because these sites specialize in quotes only, most people assume they are the best resource for quotes. In reality they are the worst resource for quotes. The popularity of quote websites has created a plague of misquotes, and sadly, academia has become infected. History is now being rewritten because misquotes are actually being taught in our educational institutions. For example, my 12/31/15 post No, Clara Barton did not write that is about a misquote that is featured in most contemporary nursing textbooks as well as on nursing school websites. Students are being taught that Clara Barton wrote something that was actually written by someone else. My 03/31/16 post No, Margaret Fuller did not write that is about a quote by Thomas Fuller that is attributed to Margaret Fuller on websites of prominent universities. This misquote even appears in a thesis found online for a Master of Arts in English. The subject of this thesis is actually Margaret Fuller. Go figure! My 11/30/15 post No, Leonardo da Vinci did not write that is about a quote by Thomas Paine that is attributed to Leonardo da Vinci on a website created by K–12 principals and school administrators. One can only wonder what other parts of history are being rewritten. 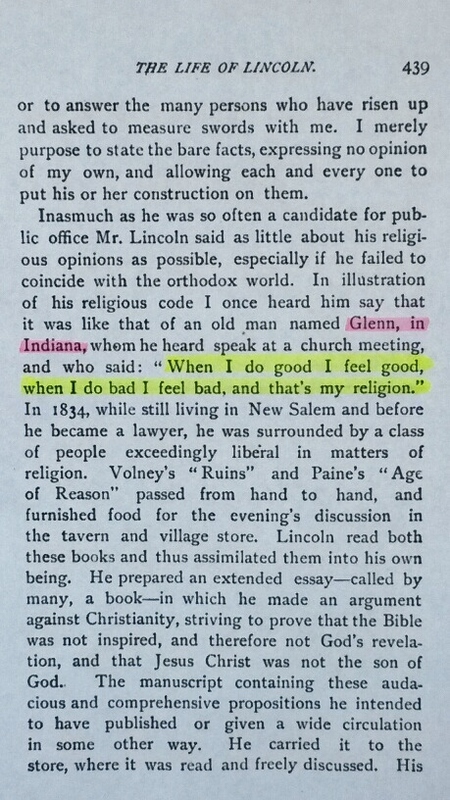 This misquote appears as early as 1906 in A Conspectus of American Biography Being an Analytical Summary of American History and Biography (James T. White & Company, 1906) compiled by George Derby. 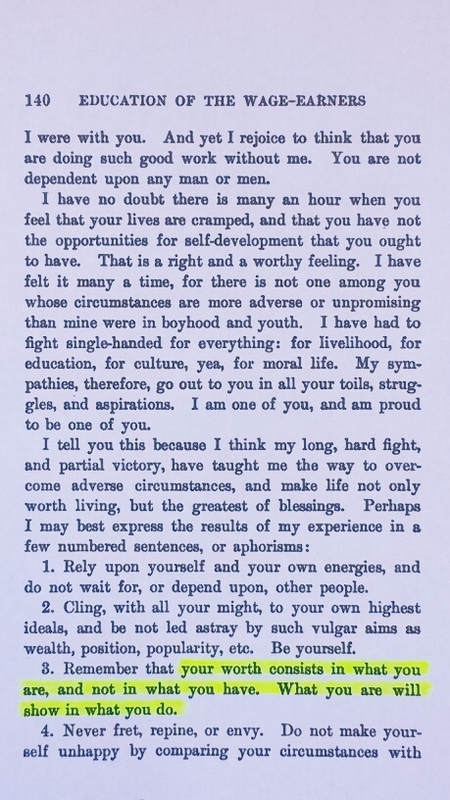 It also appears in Character Lessons in American Biography for Public Schools and Home Instruction, fifth edition (The Character Development League, 1909) by James Terry White. The common denominator is James Terry White, and yes, these two instances of James T. White are one and the same. I cannot say with certainty that he is the originator of this misquote, but he definitely contributed to it. 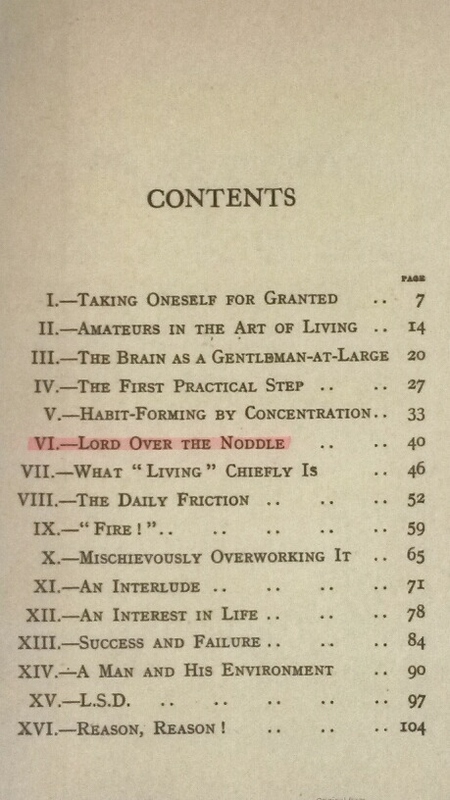 During my research, I came across 18 books featuring today’s misquote. All were published in the 2000s. Six of them are quote books. As I’ve written before, the vast majority of quote books published after the inception of the internet are riddled with misinformation. Unfortunately, contemporary authors use quote websites as a resource for their quotes, and consequently, their books are about as reliable as quote websites. The one thing that most quote websites and modern quote books have in common is that neither provides source data with each quote. Typically, the quoted person’s name is the only information given. This is a red flag indicating the quote was probably not verified. The attribution should also include the title of the work in which the quote is found along with applicable information such as chapter, act, scene, line, stanza, etc. As usual, today’s misquote is available for purchase. For $24.62 you can have your own 24″ x 36″ misquote poster. Now that’s a steal! There’s no vaccine for the quote virus, so the only way to combat it is through education. You can help by sharing the knowledge, especially with a teacher or professor. Forward this post to family and friends, and if you’re on Facebook, “like” my Facebook fan page. If you’re on Twitter, you can follow me @SueBrewton. Today’s post is about an inspirational quote that is often misworded and misattributed to Margaret Fuller as well as Winston Churchill. Follow along to learn who really wrote it and who is spreading this inaccurate information. Less popular variants include the plural word “candles” followed by “from it” or “by it” and singular “candle” followed by “from it,” “by it,” or “in it.” These versions are for the most part attributed to Margaret Fuller. Oddly enough, I also came across a single occurrence of attributions to Jonathan Winters, Mary Engelbreit, A. K. Khan, and Professor Ursula James. Most likely these lone wolf attributions will begin to multiply across the internet over time. 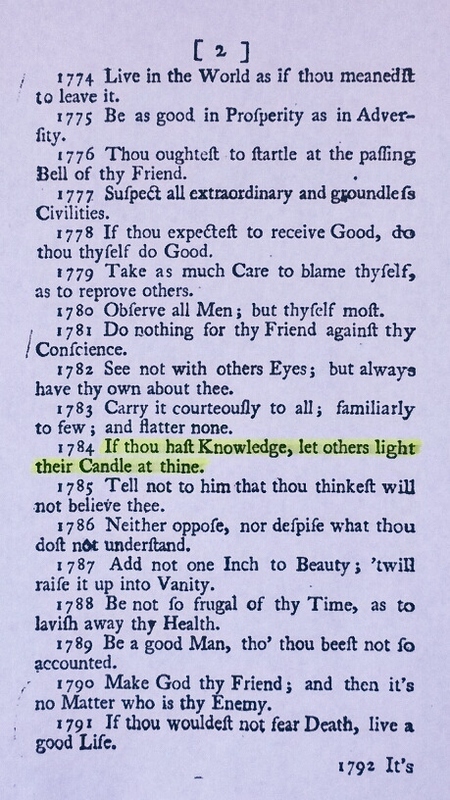 Here is the quote found in Introductio ad Prudentiam: or, Directions, Counsels, and Cautions, Tending to Prudent Management of Affairs in Common Life, Part II first published in 1727 (Part I was published in 1726). 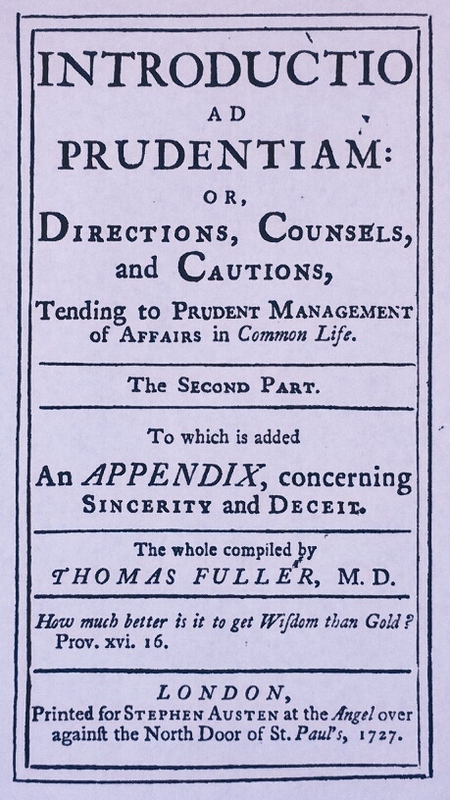 Here is the title page showing Thomas Fuller is the author. 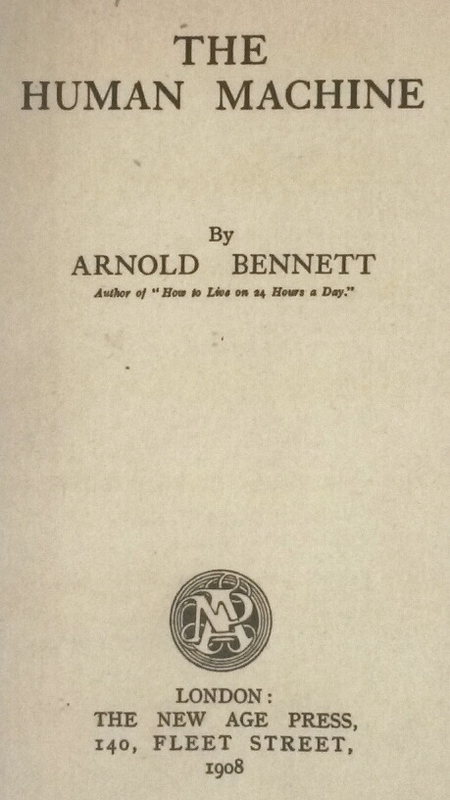 An earlier version of the book was published in 1725 with the above title sans the first four words. The Thomas Fuller responsible for today’s quote was a British physician who lived from 1654 to 1734. 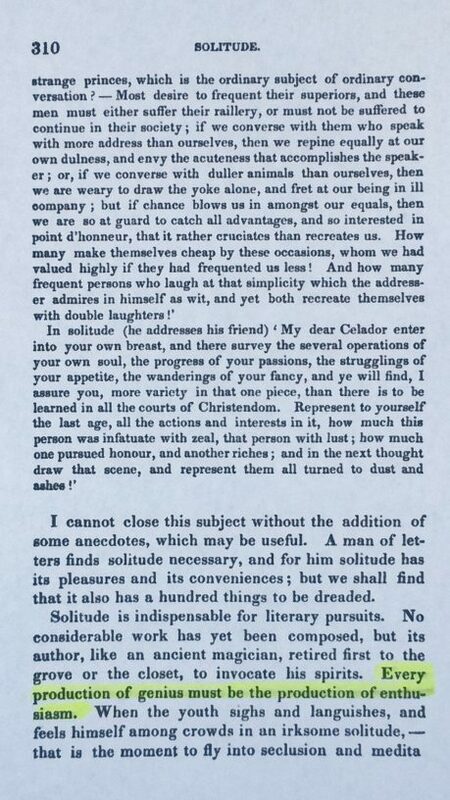 Do not confuse him with the Thomas Fuller who was a British cleric and author who lived from 1608 to 1661. Additionally, do not confuse him with the Thomas Fuller who was a Virginia slave famous for his mathematical abilities and lived from 1710 to 1790. If you’re going to cite this quote, please give credit where credit is due and specify which person it is (Thomas Fuller, MD [1654-1734]). After surveying 150 websites featuring today’s misquote, I found the following trends. The above statistics show that websites with the sole purpose of providing quotes are the largest group propagating today’s misquote. If we combine them (33%) with the websites that provide quotes as a major part of their functionality (7%), we find that 40 percent of the websites perpetuating this misinformation are major quote repositories. The lesson here is never use a quote database found on ANY website as a resource for quotes. They are focused on quantity instead of quality. The worst offenders are the ones that allow any random visitor to add to the collection. By the way, some quote websites provide other information in addition to quotes such as poems, lyrics, and short stories; I include them in the quotes-a-major-feature category. This category also includes websites that have a major quote database (10,000+) found under a tab or link on the home page. The above statistics also show that informational websites are another major contributor to the proliferation of today’s misquote. I categorize informational websites as any website that provides news and/or information about random or specific topics. For example, I found today’s misquote on informational websites about women’s history, Margaret Fuller, and feminism. Obviously, these administrators and contributors did not fact-check their data even though they represent themselves as experts on these subjects. Again, never trust a quote found on ANY website—even if the website presents itself as an authority on a given topic. The only exception is if the quote is accompanied by detailed original source information that can be easily verified. Unfortunately, most quotes found anywhere on the internet are derived from either quote websites or modern quote books. During my research, I came across 31 books that feature our misquote, and six of them are quote books. As I’ve written before, if a quote book was compiled after the birth of the internet, it is most likely riddled with misinformation derived from quote websites and other contemporary quote books. If a book does not provide detailed original source information with each quote, it is unreliable. For example, if a quote is from Charles Dickens, the citation should include his name as well as the book and chapter in which the quote is found. The name alone is not sufficient. If the book is not a quote book, misquotes are often found at the beginning of each chapter, a style popular with contemporary authors. Of course, misquotes are also found within the narrative of a book, usually preceded by the name of the cited author followed by the words, “once said,” “said” or “wrote.” Again, if the book was written after the inception of the internet, the quote is not reliable. The author most likely used a quote website as the source. This does not mean that quote books written prior to the internet are infallible; it means they don’t feature as many errors as their modern counterparts. The obvious assumption one would make about why Margaret Fuller gets credit for a Thomas Fuller quote is that they have the same last name. (By the way, they are not related.) In my experience researching quotes, I have noticed that authors with either the same last name or names that follow closely in an alphabetized list often get misattributed to each other. My 03/31/15 post Edith Wharton vs. Edgar Watson Howe vs. Elbert Hubbard is a perfect example of this. Notice these three first names would be grouped together in an alphabetized list. I suspect that a quote website administrator copied quotes from an alphabetized list, and when the list transitioned from Edgar to Edith or to Elbert, the transcriptionist did not double-check to ensure the quote entered corresponded to the correct person. My 07/17/14 post Kennedy Morphs into Keats: Another Reason to Get Your Inspirational Quotes from a Reliable Source is another example of this. Of course, I am hypothesizing, but I have seen this alphabetical phenomenon many times. 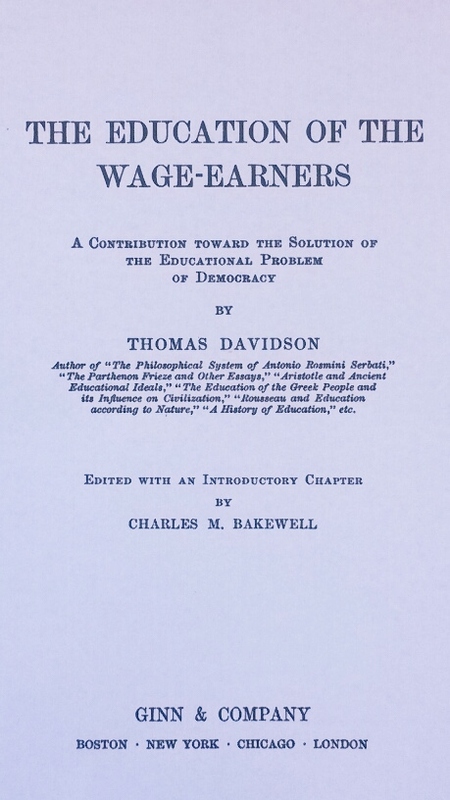 Knowing what we know about misquote propagation, or the quote virus as I like to call it, another possible cause of the Margaret Fuller misattribution could stem back to a quote book titled A Dictionary of Thoughts (F. B. Dickerson Co., 1908) by Tryon Edwards. 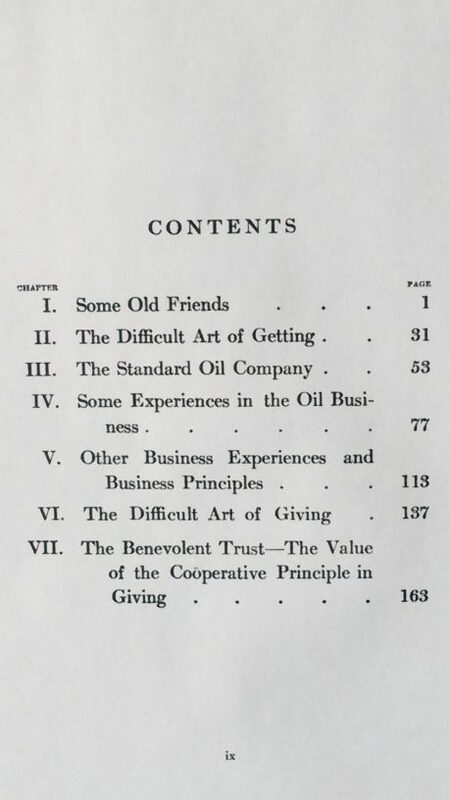 Although the attribution in the book is correct, it is presented in a confusing fashion. 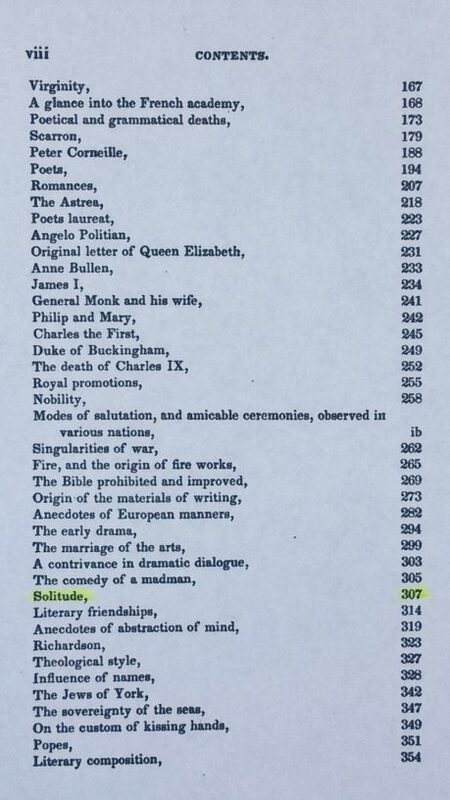 The Index of Authors at the beginning of the book lists three different Fullers: Margaret, Thomas, and Richard. The problem is each quote cites the last name only. 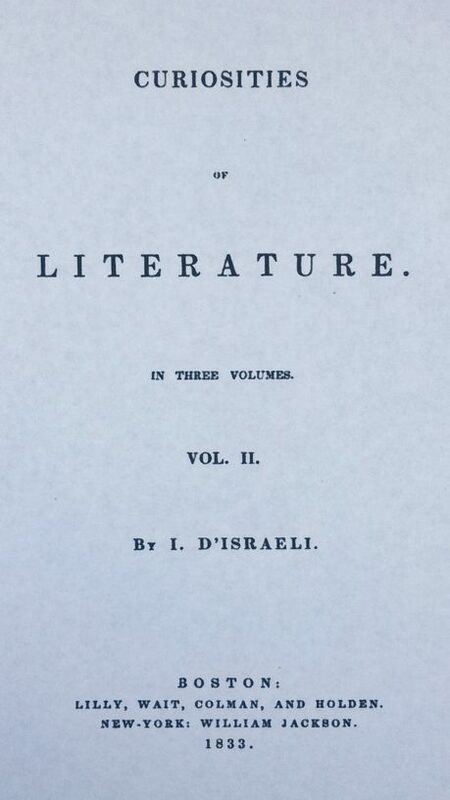 To figure out which Fuller is the correct one, the reader must consult the Authors’ Reference Index at the end of the book which specifies each author by page number. Why Mr. Edwards chose to structure his book in such a convoluted manner is a mystery; it obviously required a lot of extra time, printing, and paper. The end result is that the authors sharing the same last names get the short end of the stick because it is not eminently clear who said what. My guess is somewhere in time, another person created a quote book and used Mr. Edwards’ quote book as a source and misinterpreted which Fuller went with which quote. This is complete speculation on my part, and I could be wrong; however, after studying misquotes for many years, I can say there is a definite possibility I could be right. By the way, today’s quote is not found in any of Fuller’s or Churchill’s writings in its original wording, current wording, or any combination thereof. During my research, I came across a website that purports to be an authority on Margaret Fuller. The funny thing is not only is the misquote featured on this website but all three of the most popular versions of it are featured, AND they are accompanied by a comment stating the quote is also attributed to Thomas Fuller, her father. In reality, Margaret did not originate this quote, and her father was not named Thomas; his name was Timothy. It cracks me up that two untruths are reported in one statement completely destroying the credibility of the entire website. Another mildly amusing find appears on a website for The National Land Agency in Jamaica where a business manager writes that Margaret Fuller said this quote in 2007. Apparently he did not get the memo that she died in 1850. OK, maybe I’m being a bit harsh. I actually think I know what happened. I believe this person misinterpreted an attribution found on a quote website which reads as follows: “Margaret Fuller, Woman’s Day Magazine, Sep. 12, 2007.” This person probably thought the given date was when the quote was said. I am sad to report that our misquote appears on several websites involved with academia. The National Education Association as well as various universities, such as Notre Dame and UCLA, feature the misquote on their websites. I even came across the misquote in a thesis titled “An Examination of the Forgotten Poetry of Margaret Fuller” presented to the East Tennessee State University School of Graduate Studies Department of English for Master of Arts in English. 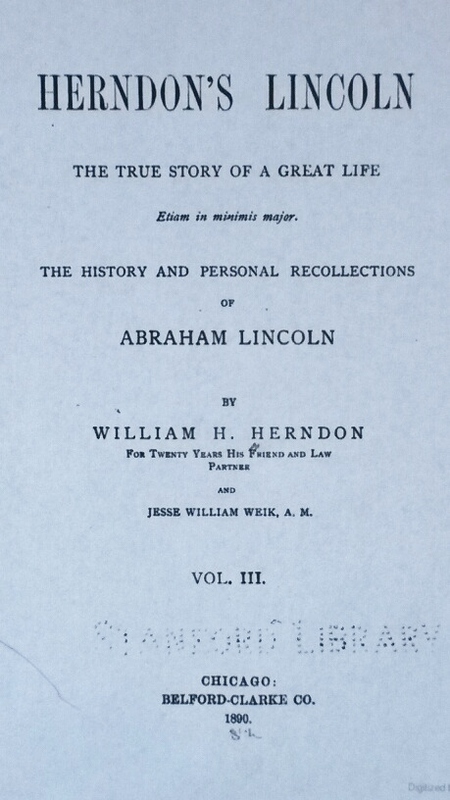 The misquote appears directly after a statement dedicating the thesis to Margaret Fuller. Considering how much research goes into a thesis, I am shocked this candidate did not bother to research the quote from the person who is the very topic of the thesis. As usual, today’s misquote is available for purchase. You can have your own misquote coffee mug for $18.90. What a steal! Misquote propagation is a quote virus. Just one occurrence of a misquote anywhere on the internet can spread like a virus to other websites. Social media websites are the most fertile breeding grounds. One person posts an infected quote, all of his/her followers get it, who spread it to all of their followers, who spread it to all of their followers ad infinitum. The only way to kill the quote virus is through education. Please help exterminate this modern-day scourge by sharing the knowledge. Forward this post to friends and family, and if you’re on Facebook, “like” my Facebook fan page. If you’re on Twitter, you can follow me @SueBrewton. Finally, remember to practice safe quoting by avoiding misquote-infested areas such as quote websites and contemporary quote books. Never trust quotes that do not include detailed original source information. Today’s post is about an inspirational quote that is not only misworded but is often misattributed to Clara Barton. Read on to learn who really wrote it as well as who is spreading this untruth across the internet and in modern literature. I have underlined the sections that are used to create the misquote. ✓One of Clara Barton’s most outstanding qualities was her almost complete disregard of precedent. The fact that a thing had always been done in a given way was evidence to her that it could be done again in that fashion, but was of almost no value to her as proving that that was the best way to do it. She always had faith in the possibility of something better. It irritated her to be told how things always had been done. She knew that a very large proportion of things that have been done since the creation have been blunderingly done, and she was always ready to listen to suggestions of better ways. Having once decided upon a course that defied the tyranny of precedent, she held true to her declaration of independence, and saw her experiment through. In this she was not reckless or iconoclastic. She simply forbade herself the cheap luxury of a closed mind. If no better way presented itself, she was content with the old way of doing. 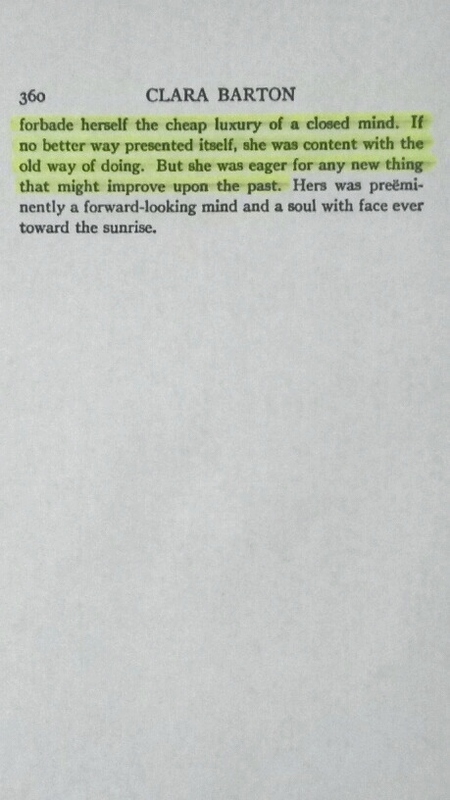 But she was eager for any new thing that might improve upon the past. Hers was preeminently a forward-looking mind and a soul with face ever toward the sunrise. 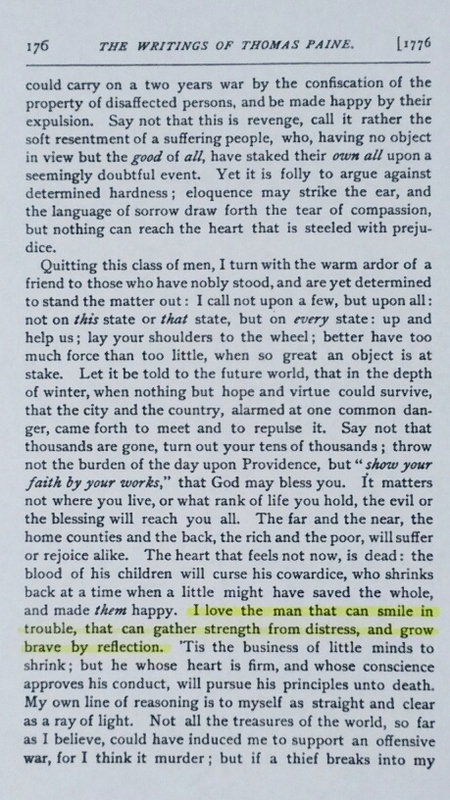 Here is the quote found in The Life of Clara Barton, volume II, chapter XVIII by William Eleazar Barton (Clara’s cousin). After surveying 103 websites featuring today’s misquote, I found the following trends. Based on the above statistics, the main source of today’s misquote are websites that specialize solely in providing quotes. As we’ve seen in so many of my previous posts, this is not a surprise. Also note the 7% of websites that provide quotes as a major feature of their functionality. If we add these two categories together, 39% of the sites featuring this misquote are quotes-only databases. Clearly, quote websites are the worst place to go when searching for quotes. The above statistics also show that social media websites are the second major source of propagation for today’s misquote. This too fits the pattern seen in so many of my previous posts. Unfortunately, social media is the breeding ground for the quote virus. Each time one person posts a misquote, all of his/her followers get it, and then all of their followers get it and so on and so forth. It is like an infection that spreads and eventually becomes an epidemic. Unfortunately, in many cases, the untruth mutates into the truth and becomes gospel. This appears to be the case with Barton’s misquote. The bottom line is beware of those cute memes that are posted and pinned in social media. Many of them are infected. 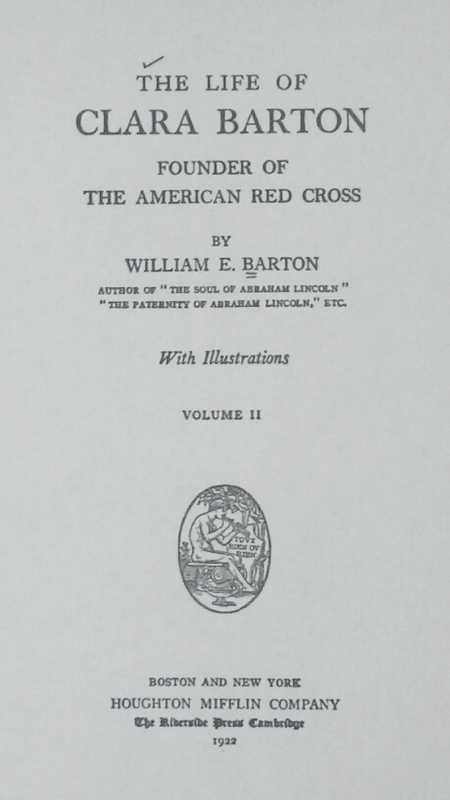 Because Clara Barton was a nurse who founded the American Red Cross, it seems it is incumbent upon nursing career books to feature this misquote. One would think books that are composed of facts and figures for the purpose of education would contain nothing but fact-checked data. Unfortunately, this is not the case. I came across 20 books featuring our misquote, and 10 of them are books on the subject of nursing. Apparently, this misquote has been around for so long that even educators accept it as truth. Today’s misquote was created by piecing together various phrases contained within two paragraphs of William E. Barton’s book The Life of Clara Barton. 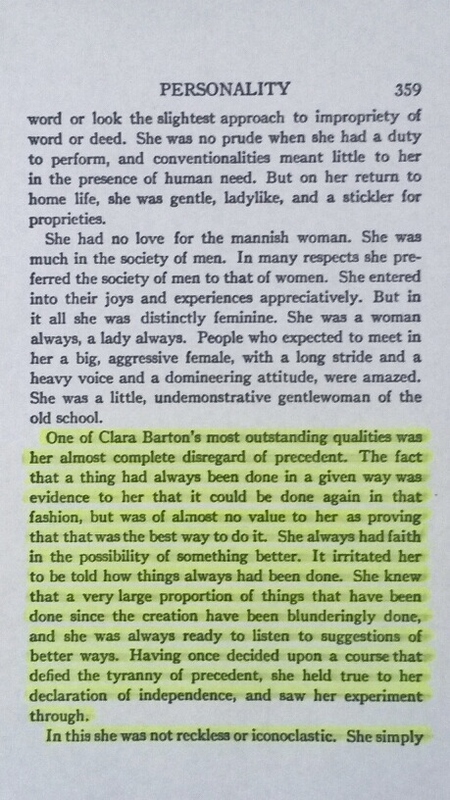 In these paragraphs, he is describing Clara from his perspective. This does not mean that she said or wrote these words; rather, they are the author’s words describing his perception of her. Apparently, somewhere along the line, someone decided to cherry-pick bits and pieces of these paragraphs and then insert the word “I” to give the impression that Clara actually wrote them. I’m not sure why someone would do this, but as I’ve written before, it only takes one person to set the quote virus in motion. By the way, Clara did author a few books, and the misquote does not occur in any of them. I came across a dissertation online that cites this misquote. This dissertation is for Doctor of Philosophy in Nursing in the Graduate Division of the University of California San Francisco. I am disappointed that academia is contributing to the propagation of this misquote. After all, these are the people who research, prove and teach facts. It’s a shame that they are part of the misquote epidemic because many of these misquotes alter history and give credit where credit isn’t due. I find it amusing that the misquote itself is about breaking precedents, yet the nursing field continues the precedent of using this misquote even though it is incorrect. Oh the irony. During my research, I came across one quote book that featured this misquote. As I’ve mentioned before, modern quote books are just as unreliable as quote websites. I would bet most of them were written using quote websites as a source. If a book does not feature detailed source information with the quote, it is not trustworthy. Citing the name of the author/orator alone is not sufficient. Details such as the name of the work in which the quote is found should be accompanied by applicable information such as the chapter, act, scene, line number, etc. As with my previous posts, I came across today’s misquote for sale. A wooden bookmark with the engraved misquote can be had for $7.50. Additionally, a money clip for nurses featuring the misquote is available for just $19.95. What a deal! Unfortunately, there is no vaccine for the quote virus. It can only be eradicated through education and safe quoting. You can be a part of the solution by sharing the knowledge. Also, if you’re on Facebook, you can “like” my Facebook fan page, and if you’re on Twitter, you can follow me @SueBrewton. Finally, remember to practice safe quoting by never trusting quotes that do not have detailed source information. Today’s post is about a wildly popular inspirational quote that is often misworded and misattributed to Leonardo da Vinci. Follow along to learn who really wrote it as well as who is spreading this misinformation across the internet. 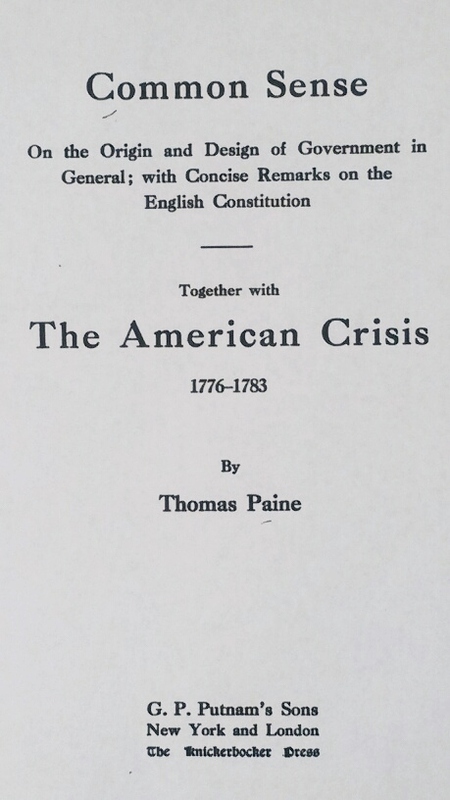 The American Crisis is a series of 16 essays by Thomas Paine published from 1776–1783 under the pseudonym Common Sense. 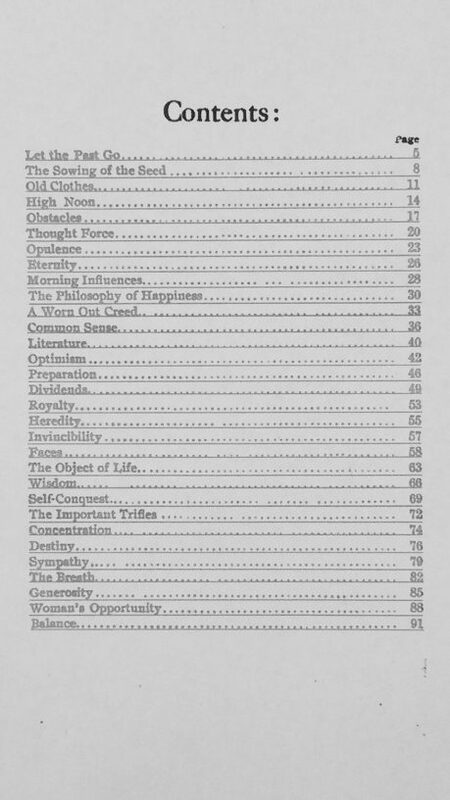 Thirteen of the essays are numbered, and the quote appears in essay number 1. 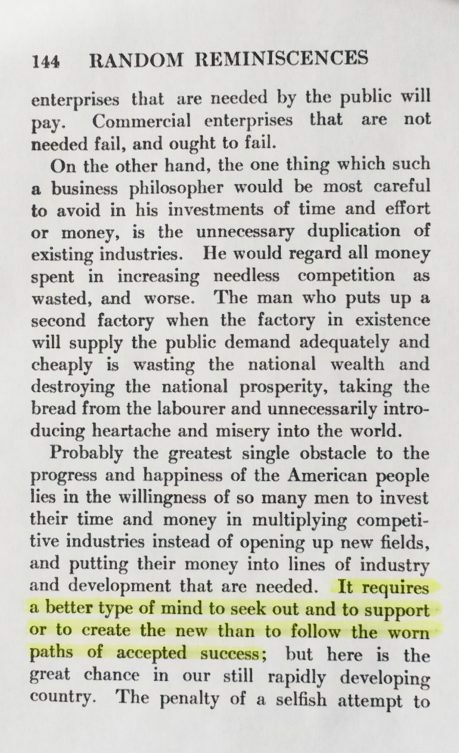 Here is the quote found on page 176 in G. P. Putnam’s Sons 1912 publication of Common Sense Together with The American Crisis. Here is the beginning of essay number 1 on page 170. Note the famous first sentence. 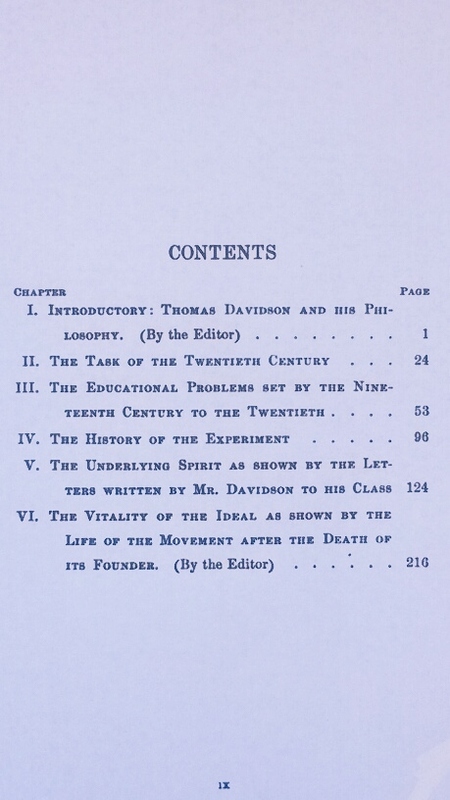 Here is the title page of the publication. 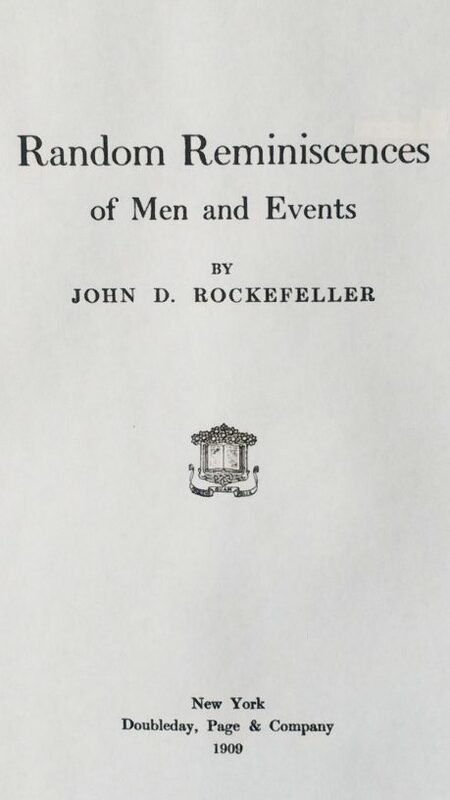 The Library of Congress has a copy of the original pamphlet published in Boston titled “The American Crisis (No. 1).” The quote appears in the third column at the end of the 23rd line (which begins with “might have saved”). The comparisons above demonstrate that the most popular versions of this misquote are misattributed AND misworded. Some may think slight rewording or paraphrasing is acceptable; however, I absolutely object to that when it comes to important historical documents such as The American Crisis. It is a shame that it is Americans, for the most part, who are attributing this quote to someone other than Thomas Paine. Rewriting the words just adds insult to injury. Based on the above statistics, the main source of today’s misquote are websites that specialize solely in providing quotes. The 7% of websites that provide quotes as a major feature of their functionality should also be noted. These two categories together mean 42% of the sites featuring this misquote are major databases specializing in quotes. This is a classic example of what’s known in computer science as GIGO (garbage in, garbage out). In other words, if the quality of the input is garbage, the quality of the output is garbage. And for some reason, the vast majority of websites that specialize in quotes have no quality control whatsoever. In fact, many of them allow any user to add any data at any time. In a nutshell, these websites should be avoided at all costs. The above statistics also show that social media is the second major source of propagation for today’s misquote. As I’ve mentioned in previous posts, the quote virus quickly and easily spreads its germs through social media. Every user that posts a misquote spreads it to all of his/her followers, who spread it to all of their followers, who spread it to all of their followers, etc. The bottom line is never trust a quote sent to you via social media. There’s a high probability it is infected. During my research, I came across an Instagram post featuring the misquote attributed to Thomas Paine. I then noticed underneath it another user posted the comment, “I think that’s a Da Vinci or DiCaprio quote.” Knowing how social media works, I wouldn’t be surprised if a new mutation emerges in the near future attributing the misquote to Leonardo DiCaprio. Stay tuned. My most amusing find is a Leonardo da Vinci website that features today’s misquote. The sole purpose of this website is to provide information about Leonardo da Vinci and only Leonardo da Vinci. One would think with a subject-matter scope this narrow all data provided would be verified. Unfortunately, this bit of misinformation makes all information on the website suspect. My second amusing find is a book of Leonardo da Vinci quotes published in 2013, and you guessed it; our misquote is proudly featured in the book. One has to wonder why anyone would go through all the effort to publish a book and not fact-check any of the data. The end result is a book that has no credibility, and the author becomes another carrier in today’s misinformation epidemic. Unfortunately, the advent of quick and easy self-publishing has contributed heavily to this modern-day plague. I was very disappointed to see today’s misquote featured as the “Quote of the Week” on a blog written by K-12 principals and school administrators. One would think educators would be a little more diligent about the information they are conveying. I was also disappointed to find a scrapbooking website based in Ohio that features today’s misquote on a list of suggested quotes to use. 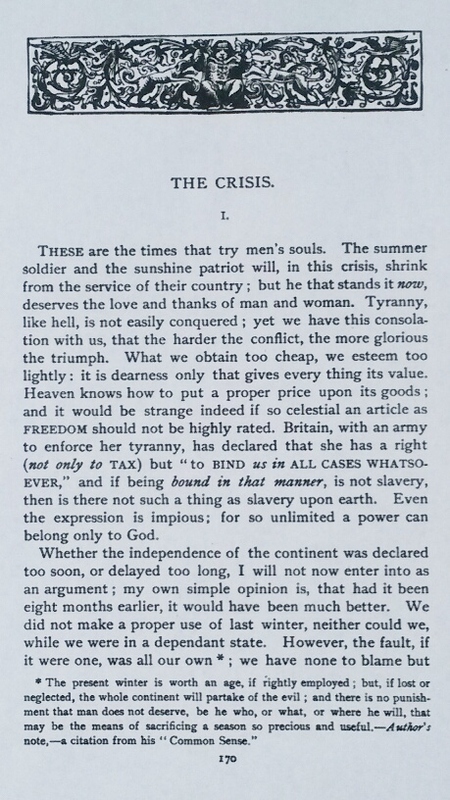 Not only is the quote misworded, but it is attributed to Thomas Payne instead of Paine. It is sad that the name of a well-known, important historical figure in American history is misspelled, and no one has noticed or bothered to correct it since 2013 when the site was established. I came across seven quote books featuring today’s misquote. The publication dates range from 2003 to 2015. Unfortunately, most modern quote books are merely compilations of quotes obtained from the internet and other previously published quote books. If there is no accompanying detailed source information with each quote, the book should not be trusted. Citing the writer/orator’s name alone is not sufficient. The source information should include the name of the work in which the quote is found followed by applicable information such as chapter, act, scene, stanza, line, etc. I also found today’s misquote in 11 books that are not specifically about quotes. The publication dates range from 2007 to 2015, and the topics vary from fiction to spirituality to stress management to water-and-waste management. As always, I found our misquote available for purchase. For $15.95 you can have your own misquote coffee mug. If you prefer something a little more artsy, a canvas misquote poster can be yours for just $59.00. It’s amazing how many flawed merchandise options there are! The quote virus can only be killed through education and safe quoting. You can help by sharing the knowledge with your family and friends. Also, if you’re on Facebook, you can “like” my Facebook fan page, and if you’re on Twitter, you can follow me @SueBrewton.